Place of worship and Christianity. One of the New Seven Wonders of the World. New York, Rio, Tokyo… In October 2015 I had the awesome possibility to spend some days in Rio de Janeiro, the City of God. Feeling the hot sun on my skin was exactly what I needed during the cold autumn months in Europe. So, once in Rio, I absolutely had to check out the wheelchair accessibility of this magical spot. Christ the Redeemer, Cristo Redentor in Portuguese, is an Art Deco statue on top of Corcovado Mountain in Tijuca National Park in Rio de Janeiro. With its 28 m wide spread out arms, it peacefully watches over the city. The 30 m high statue of Christ stands on an about 8 m tall pedestal which hides a small chapel inside. Christ the Redeemer is listed as one of the New Seven Wonders of the World since 2007. The statue was planned as a memorial of the 100th anniversary of Brazilian Independence by a team of four great men: Brazilian Engineer Heitor da Silva Costa, the French-Polish sculptor Paul Landowski, French Engineer Albert Caquot (for the intern structure) and the Romanian sculptor Gheorghe Leonida, who fashioned the statue’s head and face. The construction began in 1922 and was completed in 1931. At that time Cristo Redentor was the largest Art Deco sculpture in the world. The site is partially wheelchair accessible since 2003. The base level itself is fully accessible. From there you have to take a panoramic elevator that takes you to the upper level. The upper level features a café as well as a souvenir shop. Now we get to a point where the accessibility is not perfect. You have to take escalators up to the statue. That’s a solvable problem if you use a manual wheelchair, but it might be tough and risky if not impossible for people in a power chair. My boyfriend helped to get me up the escalators, and the staff offered to help, too. Finally arrived at the Cristo Redentor! You can stay as long as you want and enjoy the 360° view! The view of Rio and its surroundings is just beautiful. There are several possibilities to get to Cristo Redentor, but I’ll stick to the most wheelchair accessible ways. Official Transportation: A comfortable way of getting to Christ the Redeemer is to use the official vans of Tijuca National Park. The vans take you all the way up to Paneiras, the entrance platform, in about 1 hour. There are wheelchair accessible vans available, but calculate some waiting time to use one of them. Boarding spots are at Praça do Lida in Copacabana and at Largo do Machado Metro Station. Prices vary between R$ 27 (EUR/USD 8) in low season and R$ 40 (EUR/USD 12) in high season. The ticket price includes the transport round trip as well as admission to the statue. It seems like there’s no reduced fare for people with disabilities, at least there was none back in 2015. I recommend the official vans as it is the easiest and less expensive way of getting to Paneiras. You can purchase tickets at the boarding spot or online. Corcovado Railway: Another means of transport is the old and famous Corcovado tram. The tram is fully wheelchair accessible, and you can remain seated in your wheelchair. Prices vary between R$ 74 (EUR/USD 23) in high and R$ 61 (EUR/USD 18) in low season. A ticket includes the round trip as well as admission to the statue. Since August 2016 you have to buy tickets online. A negative thing is that you’ll have to find a way to get to the station. I didn’t test the tram myself and can therefore not say more about it. MY TRAVEL TIP: Come early in the morning, take a large bottle of water and sun protection with you! The Corcovado usually gets very crowded the later it gets. Do not underestimate the Brazilian sun in combination with the height of more than 700 m above sea level! I did, got sunburned and felt dizzy…! 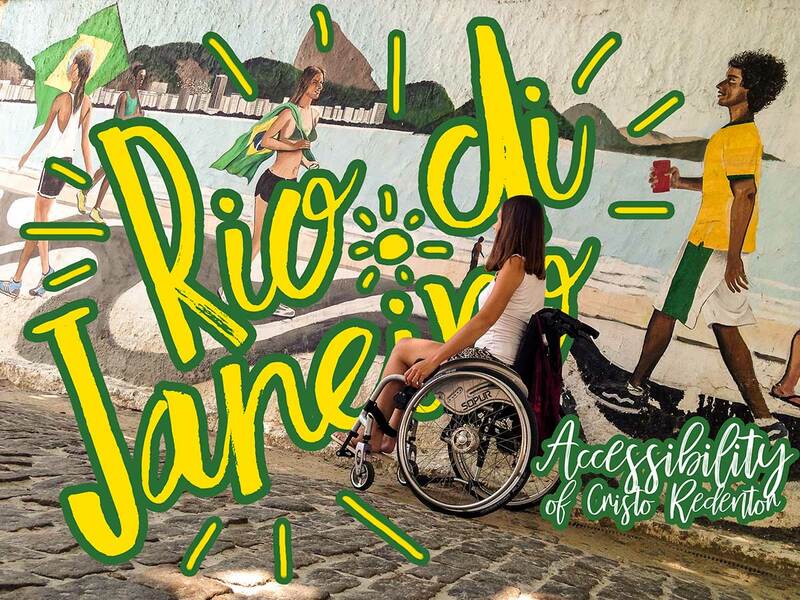 Strolling along the world-famous beaches of Copacabana and Ipanema in a wheelchair is very easy. The boardwalks are fully wheelchair accessible, and you find many nice cafés. Why not try and have some fresh coconut water or a bowl of frozen Açai, an especially delicious Brazilian specialty. On our way, we even saw an open-air gym with accessible sports equipment! Have you already been to Rio or to another destination in Brazil? How did you like it and what did you enjoy best? Please leave a comment below or get in touch by mail to discuss. Excellent! I love the photos and the information. Since I can’t fly anymore, I may have to put this on a prayer list as it is a divine splendor! Thank you for your nice comment Nancy! I’m happy to give you a little holiday with the pictures and the info :-). I’ll continue to share my adventures with you! All the best to you! Manifestement treap magnifique qui va donner des idées à bien des humains ! C’est dingue: la jeune femme élancée que tu regardes sur la fresque…L’impression que Mylène te regarde; la ressemblance est frappante pour moi ! Hi… this is very informative since I am planning to bring my dad to Rio next year. He is in wheelchair. All your inputs are really great for me and it helps me to plan a trip for him. Thank you so much. I am happy that the accessibility information is helpful to you and your family. Wishing you a great time in Rio de Janeiro.